Me and my spider…. By observing ‘her’ I end up thinking of how solitary she was and … thinking further, if spiders have a social life. Of course I turn to the web, did my search and in fact they do exist. 1st I landed on wikipedia, on Social spider page. I will not go deep into any of this for now. I just want to share some of what I observed. More information can be found by following the weblinks. After some time, Madame Diadematus disappeared. I was also away for some time, so I lost track of events. … but one day in April the eggs hatched. One day they were born…they must have :). 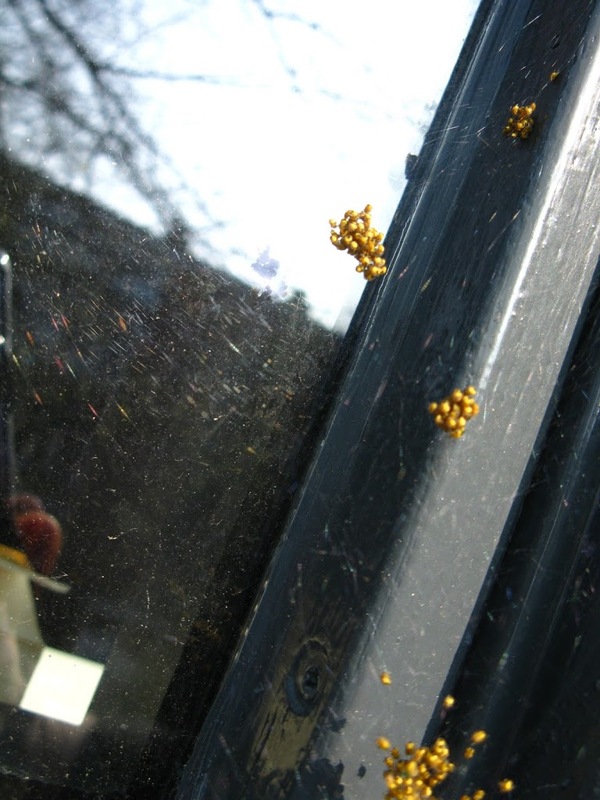 If you look at the pictures you can see groups of tiny spiders clumped together. They were together I suspect for protection (?). Maybe by grouping themselves they can simulate a larger body and predators (maybe birds? I do not know if they have predators though…) would ‘think twice’ (?). They were yellow and had a black stain (see pictures). On the other hand would this can attract insects(?) Not sure of what/if they ate! One day the little ones spread and went away. 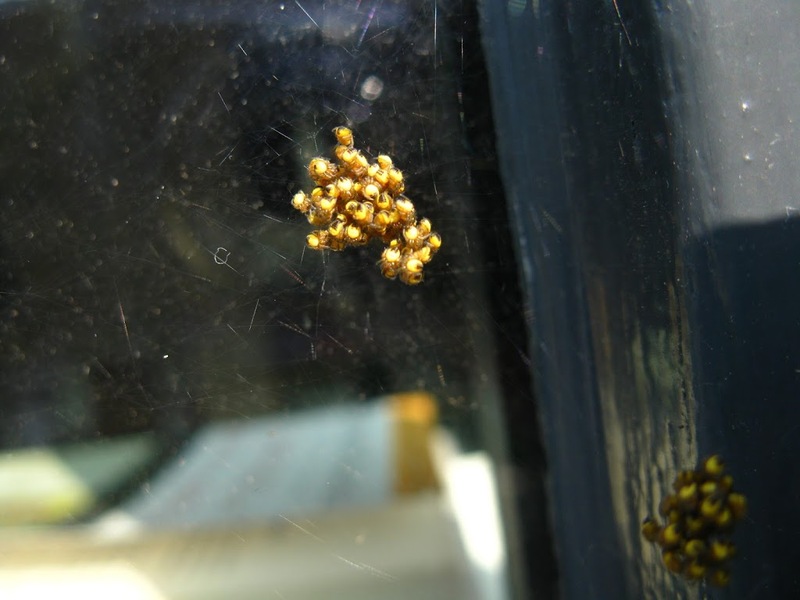 A few days (maybe weeks) later I realize that I have two spiders…one on each corner of my window… probably from those little-one’s groups. One of the many phenomena that made me travel in some completely nonlinear route to be doing what I am doing today are spider webs or how spiders construct their webs. I remember reading years ago about a study on the effects of drugs on spiders behavior while building their webs. I was fascinated at the time of course…. In fact the study goes back to late 40’s when Peter Witt, a German-Swiss zoologist working with spiders, became annoyed by the fact that his animal model build its web between 2am and 5am. He asked a friend for help: decided to use drugs to influence animal’s behavior expecting the spider to build its web in a more appropriate hour. Witt’s intentions did not succeed but he observed that web geometry of the drugged spiders changed. After that he went on trying different drugs, changed some physical quantities like temperature and light exposure conditions and observed the effect on spider web construction (for a review). The behavior induced by these drugs resulted in different patterns of web geometry. The webs built tended to be specific according to the drug taken. In some cases the web kept its size but were also observed radius irregularities or spiral spacing changes, in other cases the web became irregular and the spiral-like pattern was lost. 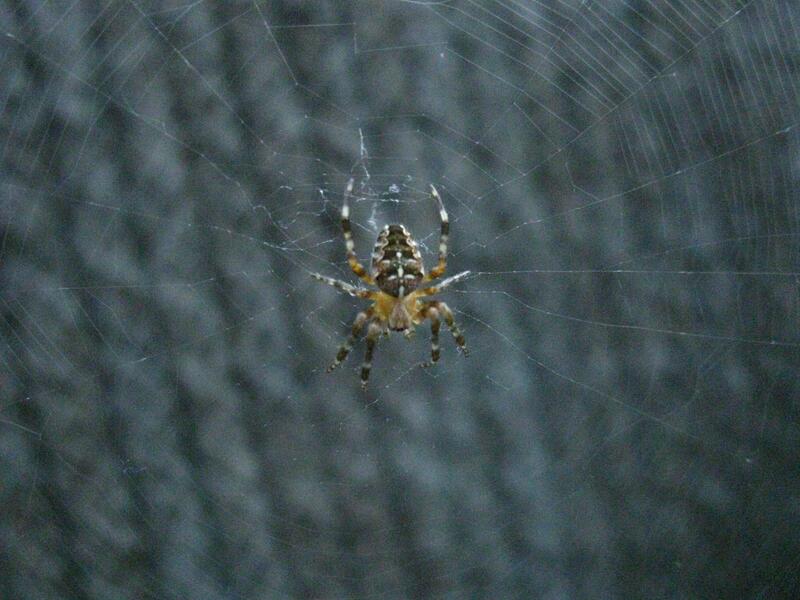 Other reported effects were changes on thread thickness, web-building frequency and size of catching area. You can find more on spider web construction here. Here you can also read about some students experiments ….take a look ,) There is one on Arabella and Anita, two spiders launched into space.